Whisk the egg yolks and lemon juice together in a non-stick saucepan adding the sugar once the egg yolks and lemon juice are combined. Stir in grated lemon rind. Cook over a medium heat stirring all the time till the mixture thickens and coats the back of a wooden spoon. Remove from heat. Cut the butter into 1/2" cubes and add to the hot mixture, stirring till dissolved. Strain the mixture through a fine sieve into a measuring jug. Fill hot 1/2 or 1/4 pt canning jars with the lemon mixture, and seal immediately. Allow the jars to cool, and then store in the fridge. The lemon curd will solidify as the jars cool, and the lids will 'pop' indicating the lid has sealed. Carefully soften chocolate in heatproof bowl in microwave. Stir till melted and smooth . cooll slightly. Beat butter and sugar together till creamy. Add the flour mixture and water and blend well. Preheat oven to 350F and bake cupcakes till tops are firm and a toothpick inserted in the center comes out pretty clean – about 25 minutes. 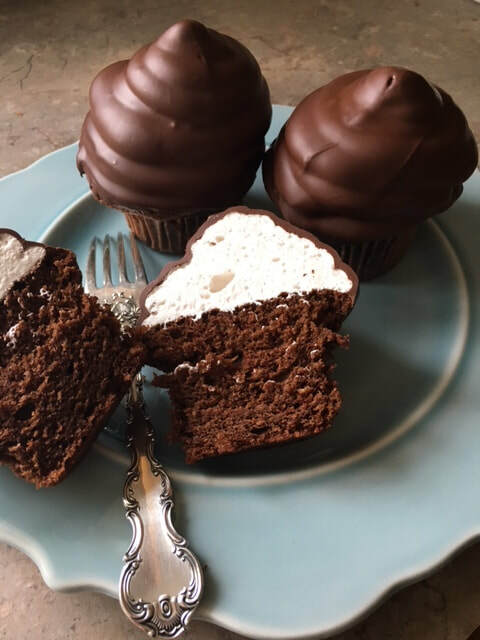 Swirl marshmallow into a cone on top of each cupcake . Put in fridge while you make the chocolate shell. ​This has been a favorite cake since I first made it when I was 15!. 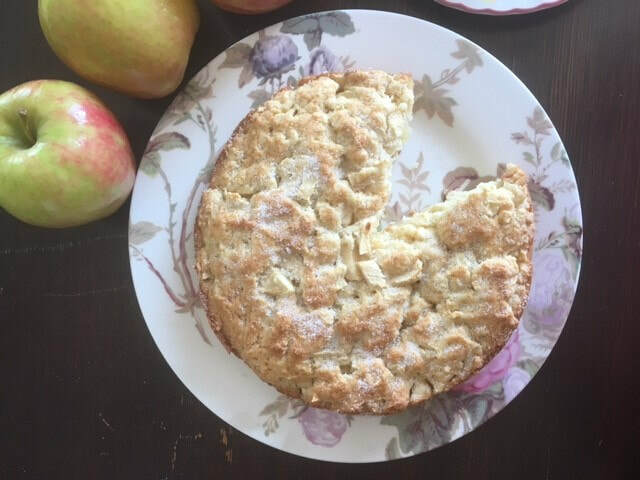 It's good because its not too sweet, has a moist soft crumb, and apples throughout, plus it's equally good as a dessert with cream or ice cream - though I like it best warm, right out of the oven! I've sped up the prep by using a food processor to create the batter, and adjusted the original English ingredients to cups instead of ounces. 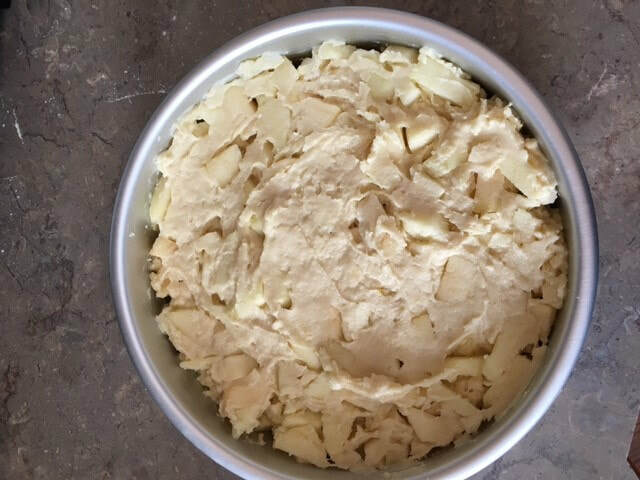 Put the flour, baking powder, butter and salt into the bowl of a food processor fitted with a mixing or chopping blade. Process the flour and butter mixture in short bursts till there are no big chunks of butter visible and mixture resembles breadcrumbs. Add the flour mixture to the apples and sugar. Mix well, adding up to 1/2 c cold water if necessary so the mixture forms a stiff, slightly dry dough. Spread the mixture in the prepared pan and bake at 375 F for 30-35 minutes till a skewer inserted in the center comes out clean, and the top crust is lightly golden. Remove cake from the oven and allow to cool for a few minutes. Turn out onto a cooling rack, or plate, sprinkle lightly with sugar and serve warm or cold. My one ﻿English cucumber﻿ plant produced at least 18 large cucumbers in the last 4 weeks (with no sign of slowing down!) and since my neighbors are dealing with their own cucumber and zucchini explosions, I was looking for something other than salad to use up this increasing cucumber collection. What to do?... 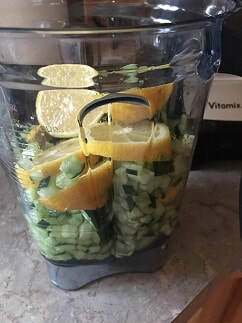 well if life hands you lemons, you make lemonade... so, why not make cucumber lemonade?! You can make this to your own taste for sweetness, lemoniness or cucumberiness, though here's a basic recipe to start you off. Adjust sweetness, tartness - it should be lemony, but there should also be a hint of cucumber. Serve over ice. Can be dliuted with sparkling water or soda too. A few days after the 4th of July we had a heatwave and I was craving something fruity, icy cold and refreshing. I also had a giant watermelon to get out of my fridge! What better way to cash in on that juicy deliciousness and gorgeous red color than combining that watermelon with some raspberries–they just go together. Hello Watermelon Raspberry Sorbet! Enjoy your summer, and stay refreshed! ​ 1. Make a simple syrup by boiling together the water and granulated sugar, stirring till the sugar is dissolved. 2. ​Stir in the frozen raspberries and lemon juice. 3. ​Put 1/2 the watermelon and 1/2 the raspberry mixture in a blender and process till there are no lumps. Strain mixture into a bowl. 4. Repeat with the remaining watermelon and raspberry mixture. 5. Chill the strained watermelon raspberry juice mixture. ​Once the mixture is cold you can pour it over ice for a fruity drink, freeze it in a cake pan till its slushy hard (you'll have to stir it every so often so it doesn't freeze solid) or you can freeze it in popsicle molds or in an ice-cream maker. I made double the recipe and used the Breville Smartscoop Ice Cream maker and used 3 1/2 c of mixture to make sorbet. I used the remaining mixture and Zoku popsicle molds to make 6 popsicles. A Vitamix is perfect to blend up the fruits. Have to admit I got the popsicle molds at Marshalls (lucky find!). The Breville ice cream maker was a bit of a splurge, yet one of my best buys ever. I use it a lot in summer, and in winter too actually. I love that it's always ready to go, no freezing a container beforehand, just mix up the ingredients, pour into the bucket and press start! ​The Breville Smartscoop is on sale right now at Williams-Sonoma and Costco always has the best price on the Vitamix. I love to travel and I love food. Who doesn't, right?! I grew up in England southeast of London in a small seaside town renowned for its oysters, and with a fish and chip shop that (IMHO) is the best in the world! I cooked my way to a lovely life and now live in Oregon, USA, a state known for its luscious berries, hazelnuts, fresh seafood and creative cuisine. I'm a fan of cooking from scratch because the flavor, the texture, the smell and the taste of homemade is more than amazing–it's satisfying and comforting too. Sharing food with family and friends are good times we fondly remember, as well as the delicious food we ate!